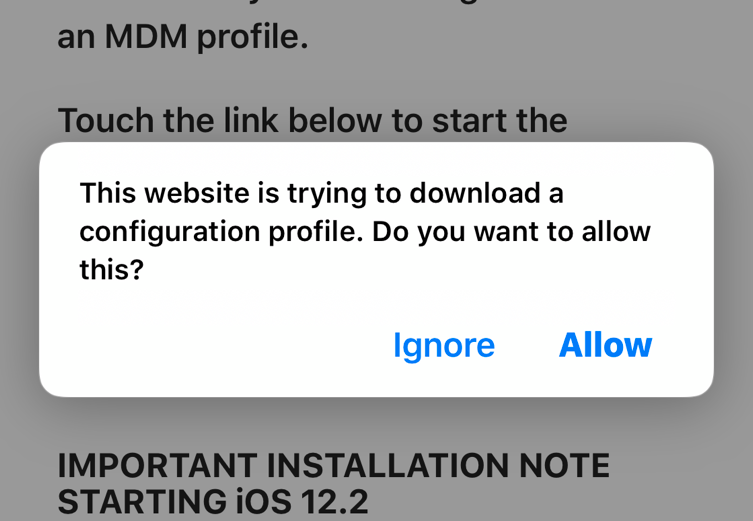 While testing the final release of iOS 12.2 by Apple, and in the midst of walking through their latest features, we noticed a nice new “feature” for enterprise users onboarding their iOS device with the App47 App Store. Yes, we say “feature” with all sarcasm implied. Since we first started onboarding iOS devices using the WebClip method, the user touching the link to start the process has prompted the download of information needed for the device from our servers. The user is then walked through the process. It was straightforward and easy. As of the launch of iOS 12.2, users are now informed that they’ll need to go to settings to accept the profile and install it. (See our blog lead image, top right, for an example of this.) This isn’t a huge deal in the grand scheme of things, but there are two major issues for your employees. First, it’s not what they’re used to. There will be some retraining involved. Second, and more importantly, the user has to leave the Safari app, open up settings, find the profile, and click “install.” This critical step was previously started for the user. The long and the short of it is that this new update negatively impacts your enterprise users. This may not be a big deal for some, but we can imagine it being cumbersome for some users, especially those who aren’t particularly tech-savvy. For now, we’ve added instructions to the onboarding UI to help users understand the steps required to complete the install. More information (including some screenshots) can be found in our new support post here. As for what you can do? Tell your Apple representative, support team, or account manager that this change isn’t ideal, and impacts your enterprise users–we know we’ll continue to do just that in the coming days and weeks.